Just like good old Cooper’s Sparkling Ale it was cloudy but fine when we pulled into Glen Helen for our first ever Top Half Folk Festival in the spectacular McDonnell Ranges west of Alice Springs. It’s been a long time between Top Half drinks for me – 9 years in fact – and the last time Mary River 2004 I supplied the bloody drinks, at my Wort’s and All home brew workshop that year. Since then distance, work and commitments to our own local Palm Creek Folk Festival (held the same weekend) have conspired to keep us away from a festival which was once an annual event for us. We made a last minute decision to come this year – and we weren’t disappointed. Top Half Folk Festivals have been all about meeting up with mates from all across the north and beyond, sharing good music, poetry, craic and the odd drink, over three days and (very late) nights. The 43rd Top Half was no exception, though perhaps the nights weren’t quite as late this year – for me at least! Given the aging Top Half demographic – many “Top Halfs” are less hirsute and several (not 50) shades greyer these days – I did wonder about the financial wisdom of providing senior’s concessions. Perhaps under 30s concessions might be more profitable, but the Top Half Folk Festival has never been about profit – it’s about folk. In the old days these folk would take a week or so to drive to the annual Top Half as it rotated between Darwin,Alice and Mount Isa. Time seemed to matter less back then and flying was still expensive. It’s different these days, though I was surprised at just how many folk drove from all aroundAustralia on their Top Half pilgrimage to Glen Helen this year. However, enough of this reflection stuff and on with the festival review. After a 9 year absence I was thrilled to see and hear such a well-balanced mixture of old and new, local and interstate, young and not so young performers in the concert program. At one end of the age scale we had the unsinkable 80 years young Ted Egan, a national treasure and Top Half stalwart, still singing his heart out and enthralling us with songs about the real Australia. At the other end there was 11 year old Josh Gray and his support act father, Phil, who sang us other songs ofAustralia, from the pen of earlier writers such as Don Henderson and Edward Sorenson. The concert program featured a diverse range of music genres from Klezmer and Gypsy music of Europe (courtesy of Rusty and the Infidels from Alice and The Weeping Angels from Adelaide) through to traditional Celtic and Australian ballads and contemporary compositions from the world over. Nevertheless it flowed seamlessly and I enjoyed all of it – and that’s saying something, given I’m used to doing stuff at festivals rather than sitting on my bum listening. The concerts also featured an impressive array of singer-songwriters, including Top Half favorites Barry Skipsey, Dave Oakes, Dave Clark and others, and importantly several new young performers. I was especially impressed by Jeanette Wormald and Katie Harder, both part of a strong Alice Springs contingent of younger performers, including Sally Balfour, which bodes well for the future. 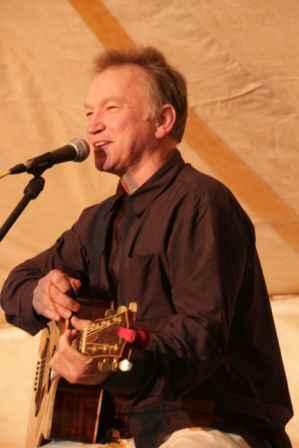 Singer-songwriters have always been the lifeblood of folk traditions, including the folk revival, as Phil Beck illustrated so eloquently in his workshop. More on that later. There were two other aspects of the concert program that stood out for me. First and foremost was the chance to see former Redgum performer Hugh McDonald in concert – twice in one weekend! 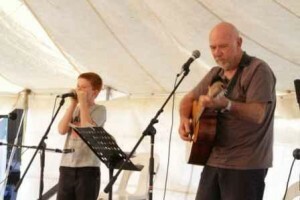 Our kids cut their musical teeth on Redgum and I don’t think we have a single album that wasn’t worn out long ago. I’ve long been an admirer of Hugh’s powerful songwriting, from the time of Diamantina Drover to his more recent Spirit of the Land. However I didn’t appreciate just what a fine musician he is – a true guitar virtuoso across such a range of styles. His stage presence was easy and unaffected, as was his singing style and audience engagement. While he expressed some initial trepidation at being the “headline act” at a festival he’d barely heard of, I think he genuinely enjoyed performing to such an appreciative and knowledgeable audience at Top Half 2013 – and he said as much in a note to festival organisers. Of course the high standard of guitar playing didn’t stop with Hugh McDonald. I don’t think I’ve been to a regional festival which displayed such finger picking talent from so many performers, including Top Half stalwarts Phil Beck, Bob Sharp, Don (the) Bruce, Chris Pemberton and more recent Top Half convert Dave (Mojo) Mullen from Townsville. It was indeed sweet music to the ears – and an incentive to practice more in my retirement! Juxtaposed to this was the wonderful unaccompanied singing of Australian folk revival legend Margaret Walters, who is fast becoming a Top Half regular. When Margaret starts singing you never quite know whether you will be graced with a sensitive rendition of a serious traditional ballad or a humorous or bawdy ditty, such is her style. She gave us that and more at Glen Helen. Workshops have traditionally been a feature of Top Half Folk Festivals and this one was no exception – despite the absence of a Paul Stewart “entertainment” this year. Nevertheless we were well and truly entertained – and informed – by two fine workshops. On Saturday morning Phil Gray and the Tabby Knackers Choir and Ensemble presented insights into the life and works of Henry Lawson to mark his 146th birthday. Many of Lawson’s poems have been set to music by performers such as Pricilla Herdman, Chris Kempster and Hugh McDonald and we were treated to many fine renditions from the assembled cast. On Sunday morning we were treated to A Potted History of the British Folk Revival (50s, 60, 70s) by Phil Beck and friends, with Paul Stewart as the principle narrator (can’t keep him out of the action). Stewie informed me that he’d already cut Phil’s narrative down by two thirds, yet the intro was still nearly 15 minutes long. However quality will always win out and that’s what we received in Phil’s insightful analysis of the British folk revival, punctuated by lovely renditions of songs like Lord Franklin, The Sun is Burning and others by Scotty Balfour, Phil Beck and others, which had me channeling my old mate Geoff Illif back at the Governor Broome Folk Club in Perth in the early 70s. 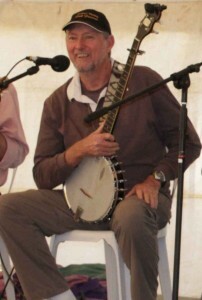 The workshop ended with a fine rendition of a Top Half favorite They Don’t Write ‘em Like That Anymore and once again I was channeling another old mate – Paul Lawler, back in the Gun Turret days of the Top End Folk Club. I’m sure other Top Enders were doing the same for “Lawls”, who is not well at present. The audience left both workshops well entertained and better informed, which is what happens at all Top Half Folk Festivals. 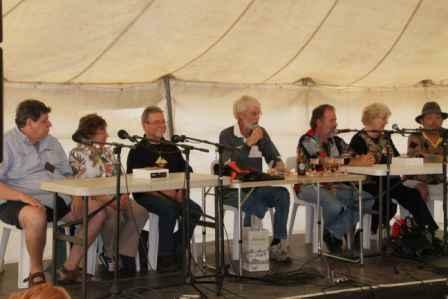 The now-famous Folk Quiz, organised by Dave Evans and Scotty Balfour was another highlight for me. Based loosely on Spics and Specs, it aimed to test the ageing grey matter of the festival’s finest folk minds – and test them it did! Thankfully it was programmed for Saturday afternoon, before too many late nights and the odd alcoholic beverages took their toll. With teams comprising Paul Stewart, Margaret Walters and Barry Skipsey on one side and Phil Beck, Bob Sharp and Nerys Evans on the other, it was bound to be riotous, if nothing else. The scoring system soon became more indecipherable than an Egyptian hieroglyph, as the judges struggled to keep up with the pace. I’m not sure the declared winners deserved their victory, though Barry Skipsey’s failure to recognize his own song (just because it was played in a completely different style and beat) certainly cruelled it for his team. In the end the real winners were the audience, who were well entertained – and better informed yet again. Poet’s breakfasts have become a feature of many folk and country music festivals around the country, but these days it’s hard for the average Joe Blow spruiker or poet to get a look in. Not so at the Top Half Folk Festival, under the guidance of the inimitable Jim Smith, another Top Half stalwart from southern climes. 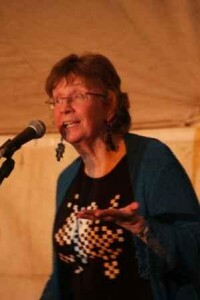 Anyone who had a poem or two is encouraged to chip in – and they did, with a wonderful array of humorous and more serious verse from old hands and new comers alike. More power to you and your arm Jim. Two other important events took place at this year’s Top Half. 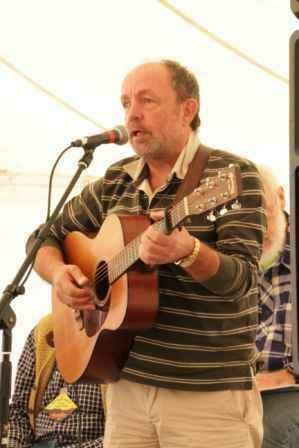 First was the launch of Scotty Balfour’s new album Motherland at lunchtime on Saturday. I’ve always loved listening to Scotty’s easy singing style and fine interpretation of traditional and contemporary song. I think his voice, like fine wine, keeps maturing with age. The second event was the launch, at lunchtime on Sunday, of Peter Bate’s history of the Top Half Folk Festival. 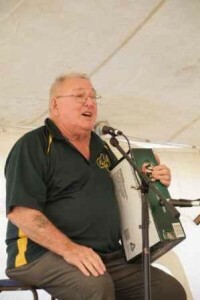 Peter, himself a Top Half “first fleeter” has long been a custodian festival and folk club memorabilia and his little book is a invaluable record of the wonderful history of a folk festival that has outlived so many others to become an icon of Australia’s folk revival. Well done Peter. Finally, the one thing about the Top Half Folk Festival that always makes it a standout for me is the singing. That might seem a strange thing to say, when folk festivals are traditionally full of singing. But these days that singing is more about performers singing TO audiences, not ordinary people singing their lungs out WITH performers. Again not so at the Top Half – and it’s not just at the famous late night sessions, so much a part of Top Half tradition. It’s at the concerts too, and the workshops. Top Half folk, be they performers or audience, love to sing, and love to join in. At Top Half Folk Festivals there are fewer barriers between performer and audience – and it shows. Hugh McDonald saw it and was blown away by it, as are other “southerners” who venture north to discover what those who live in the Top Half have always known. It’s something I really miss, but I know where to find it. Long may it remain part of the Top Half Folk Festival – that unique little single-venue long weekend event which Hugh McDonald so aptly described as “boutique”. Now I’m not sure my old Top Half mates Stewie, or Batey, or Evans or Beccy would like to be labeled “boutique”. On the other hand perhaps they are a bit like the boutique beers I like to drink – better than the average, different and interesting and full of character – as is the Top Half Folk Festival. Just don’t tell too many people, or they’ll all want some! Then again, the rest of Australia could do with a little of what the Top Half offers, so why not let them in on the secret!